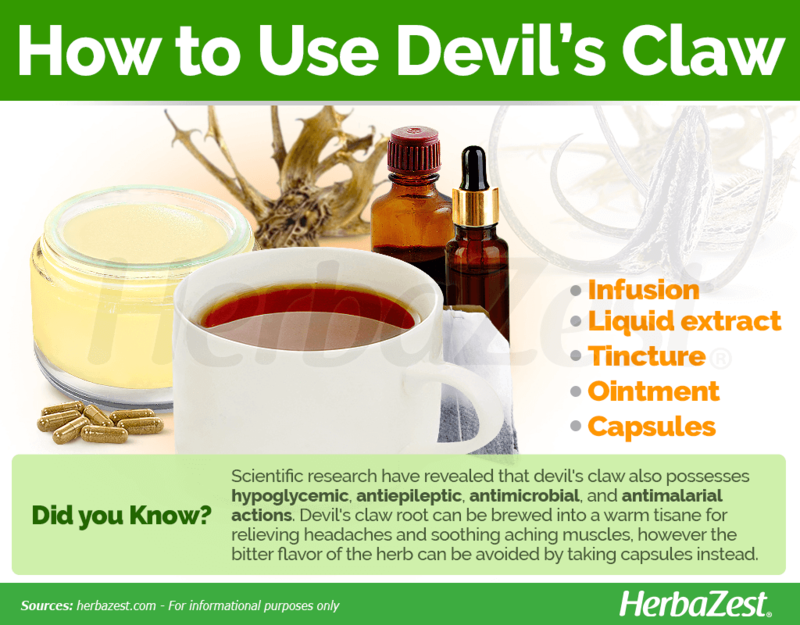 Devil's claw is an herb that has been used since ancient times for its health benefits. Learn everything about devil's claw properties, forms of consumption, history, and more. Native to southern Africa, devil's claw is characterized by its tough-looking fruits, which have barbed hooks. in fact, its botanical name, Harpagophytum, means "hook plant" in Greek. Devil's claw has been used for thousands of years to treat various ailments, and nowadays it still enjoys great popularity as a healing plant. Reducing inflammation. The plant contains anti-inflammatory properties, making it effective in treating both internal and external swelling. Easing arthritic pain. 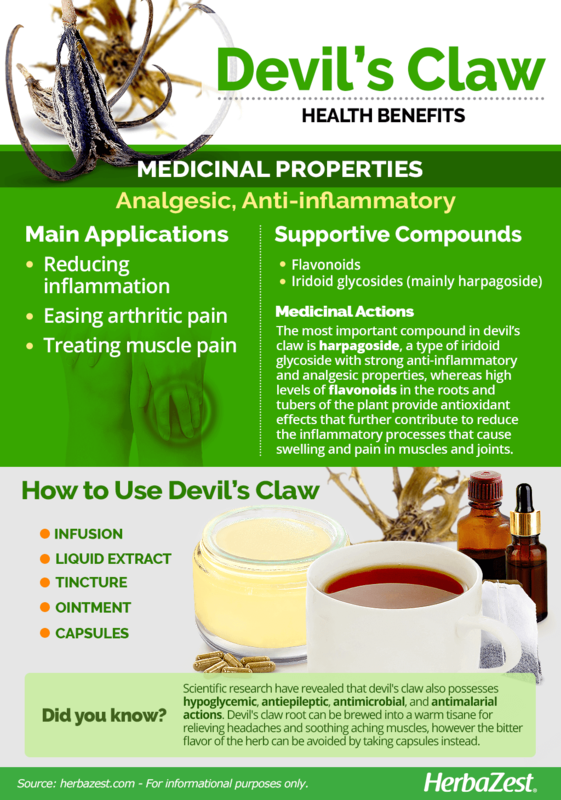 In addition to its ability to reduce inflammation caused by arthritis, devil's claw possesses chemicals which can act as a pain killer, thus it can relieve pain caused by this condition too. Treating muscle pain. In France and Germany especially, devil's claw ointment is popular for applying to the back and neck to relieve muscle pain. 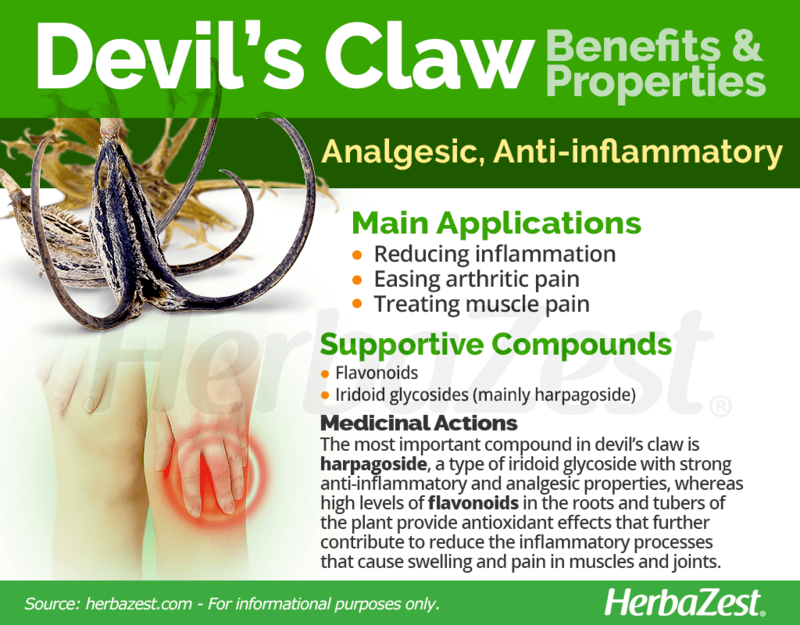 There are various further claims about devil's claw benefits, however there is little to no scientific evidence to support them. Some herbalists recommend the plant as a treatment for headaches and fever, and it has also been suggested that the bitter taste can make it effective in treating stomach complaints such as nausea or loss of appetite. One of the main biologically-active components in devil's claw is harpagoside. This is a type of iridoid glycoside, which are chemical compounds known to have anti-inflammatory effects. The presence of harpagoside can inhibit inflammation before it begins. Other active constituents are flavonoids, which boast antioxidant and anti-inflammatory properties, and phytosterols, mainly stigmasterol, which has the potential of lowering cholesterol in the human body. Scientific investigation has shown that devil's claw also possesses analgesic, hypoglycemic, antiepileptic, antimicrobial and antimalarial features; however the mechanics of these medicinal properties are yet to be fully understood. Analgesic properties are also present in cloves and coffee, whereas ginger and turmeric can provide similar anti-inflammatory benefits. Devil's claw is largely considered safe to consume in moderate doses, however some mild side effects have been reported. These are usually a consequence of high intake, and include stomach upset, diarrhea, headaches and rashes. It is believed that devil's claw can interact with some medication including blood thinners, antacids and anticoagulants and antiplatelets taken for diabetes. Anyone who is taking these - or similar - drugs should speak with a doctor before taking devil's claw. There have been some rare, extreme cases in which consumption of devil's claw has caused an abnormal heart rate and bleeding. People with heart disease and blood pressure problems should be cautious when using this herb. Research into the safety of devil's claw consumption for children, as well as for pregnant and breast feeding people is limited, so it is particularly advisable to seek advice from a health professional. Devil's claw originated in Africa, where people have been consuming the plant naturally for many years. Since the plant was introduced to Europe, its components have been used to make supplements - which has become the most popular and easiest method of ingestion. Devil's claw is not generally consumed as a food, although in some parts of Africa the young pods and seeds are roasted for consumption. They are generally added to other meals to bring an interesting texture, and for added nourishment. Devil's claw root and tubers have been traditionally used in medicinal preparations. Infusion. Devil's claw root can be brewed into a warm tisane for relieving headaches and soothing aching muscles. Liquid extract. This highly concentrated preparation allows for a better and faster absorption of devil's claw active compounds compared to capsules. Ointment. Suitable for treating external inflammation and pain caused by conditions such as arthritis, sores, ulcers, and boils. Tincture. This preparation should be diluted in water and it is ideal to provide pain relief. Capsules. This supplemental form is often favored for delivering the medicinal devil's claw properties in easy to swallow, standardized daily doses, without the characteristic bitter flavor of the plant. Fresh devil's claw is not commonly sold, but the dried roots and tubers can be bought online on herbalist websites, and in specialized health stores. Although devil's claw was once only used in Africa, it is now widely available year-round in pharmacies and health food stores all over the world, as well as being easy to find online. Since devil's claw supplements are often adulterated with other bitter herbs, which reduces their medicinal effects, it is recommended to carefully read the labels and make sure they contain only Harpagophytum procumbens. The devil's claw plant (Harpagophytum procumbens) is indigenous to the semi-arid savannah areas of Southern Africa, mainly Botswana, Namibia and South Africa. It thrives in warm climes; however, it can be successfully cultivated in cooler environments across the world. An awareness of the plant's favored conditions is helpful before endeavoring to grow devil's claw at home. Devil's claw prefers loamy soil, with a neutral pH. The devil's claw plant requires in full sun, it has a low tolerance to cold and will suffer in frost. Also, it needs plenty of space to grow to maturity. The plants should be around three feet (90 cm) apart from each other. Seeds should be planted on the surface of the soil. Water the seeds, keeping the area slightly moist. Soil ought to be kept moist but the plant can survive dry climates. Seeds may require light scarification to germinate. The use of safety gloves is recommended when harvesting, due to the plant's sharp edges. 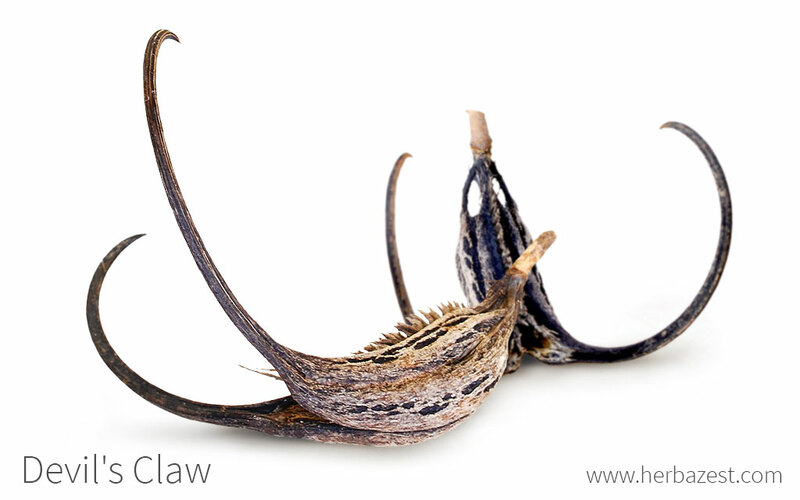 Not all tubers should be harvested as the devil's claw plant will not regenerate unless some are left behind. Devil's claw is so called because of the sharp pointed shape of the fruit. It is also sometimes known as "grapple plant", as it is able to grip onto animals and other passing objects, which it does to enhance seed dispersal. The stem of the plant can grow up to 6.5 feet (two meters) in length, and from it pink flowers and leaves develop. Devil's claw has an unusual biological feature, in that it grows from a primary tuber and then secondary tuber. The secondary tubers develop on the roots of the primary, and can be up to ten by two inches (25 x 6 cm) in size. Devil's claw (Harpagophytum procumbens) is a member of the Pedaliaceae family, also known as the sesame family after its most famous species, Sesamum indicum. The genus Harpagophytum includes 14 species distributed along seven accepted genera. All the plants within this genus share similar characteristics, such as claw-like features. There are two closely related species within the Harpagophytum genus: Harpagophytum procumbens and Harpagophytum zeyheri. While H. procumbens is the most valuable type, the other one only grows in Southern Africa, specifically in the Kalahari Desert. H. zeyheri is sometimes used for medicinal purposes, similarly to devil's claw, however it possesses fewer beneficial properties. The tubers of both species are more or less identical, which has led to H. zeyheri being unlawfully exported as H. procumbens to the United States and Europe. There are two known subespecies of Harpagophytum procumbens: H. procumbens subsp. procumbens and H. procumbens subps. transvaalensis. The medicinal properties of devil's claw were first discovered thousands of years ago in southern Africa, in the Kalahari Desert. Nevertheless, the plant was not introduced to Europe until the 20th century by Mehnert, a German soldier who had settled in Namibia and seen it consumed by local people in the form of infusion, as a medicinal treatment. It is known that Mehnert was held captive in a South African war camp in 1941, where his knowledge of devil's claw health benefits was useful to him. He is believed to have begun exporting the plant to Germany at the end of the war, after being released from his captivity. The high demand for devil's claw in Western medicine has secured its position as an important export from southern Africa. It is cultivated in many poor, rural communities and has therefore become a valued generator of income, and is relied upon by many. In Botswana, a study estimated that harvesting and selling the plant can contribute about USD 83 per household per harvesting season of three months. It is estimated that the total value of exported devil's claw in 2009 was around USD 1.20 million. There are concerns that to keep up with this high demand, the plant has become over-harvested and is not being farmed in a sustainable manner. It has become apparent that instead of extracting only the secondary tubers, farmers are removing the entire plant, which means it cannot regenerate. This is causing devil's claw to become increasingly rare, and it has now been declared a protected species in Botswana, Namibia and South Africa. Aside from its medicinal and alimentary uses, devil's claw is also used in some crafts. The roots and tubers are strong and durable, and therefore can be used in basket making and for ornamental structures. Devils' claw is a useful plant which is somewhat simple to cultivate. It has been valued in Africa for centuries, and its potential to benefit human health has been largely investigated in Europe and the United States, since it was introduced to Western medicine in 20th century. Increased awareness about how to sustainably grow the plant, should hopefully ensure that it is available to people for at least the foreseeable future.